One of the greatest environmental challenges is the cost-effective and environmentally sound management of waste. From a sustainability perspective, the generation of waste is an inefficient use of natural resources. In addition, once generated, waste can present adverse impacts to the environment and to humans who come into contact with it or with the resulting pollution. Wastes are produced and managed at all levels of society, from households to industrial facilities, and at all levels of government and commercial activities. RTI works with federal, state, and local governments in the United States and abroad in solving waste management problems both by helping local governments to identify the economic and environmental costs and benefits of alternatives for managing municipal solid waste. In all of our work, we keep sustainable solutions at the forefront, looking for ways to manage waste cost-effectively while minimizing the environmental impacts of the waste management solutions. With co-funding from the U.S. Environmental Protection Agency and the U.S. Department of Energy through a cooperative research agreement, RTI led the development a comprehensive municipal solid waste decision-support tool (MSW DST). The MSW DST is designed to aid solid waste planners in evaluating the cost and environmental aspects of integrated municipal solid waste management strategies. The tool enables users to simulate existing MSW management practices and conduct scenario analyses of new strategies based on cost and environmental objectives. The MSW DST includes multiple design options for waste collection, transfer, materials recovery, composting, waste-to-energy, and landfill disposal. The MSW DST can be used to identify and evaluate cost and environmental aspects associated with specific waste management strategies or existing systems. 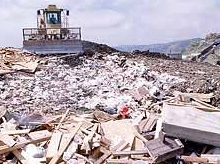 It can also be used to identify costs and environmental aspects of proposed strategies such as those designed to meet recycling and waste diversion goals, quantify potential environmental benefits associated with recycling, identify strategies for optimizing energy recovery from MSW, and evaluate options for reducing greenhouse gases, air pollutants, and environmental releases to water-bodies or ecosystems. Mr. Mitchell Kessler - TIA Solid Waste Management Consultants, Inc.
National Council of the Paper Industry for Air & Stream Improvements, Inc.